options expiry on the comex Thurs: May 25. (corrected) Options expiry for the OTC/LBMA gold/silver contracts: May 31/2017 at around 12 noon. So far our crooks are losing control over the options expiry period. Tomorrow is comex expiry but the big one is the London’s OTC expiry. If the precious metal prices hold throughout the week, then I can safely say that the bankers are running for the hills. In silver, the total open interest FELL BY 3,944 contracts DOWN to 203,459 DESPITE THE TINY FALL IN PRICE OF SILVER THAT TOOK PLACE WITH YESTERDAY’S TRADING (DOWN 6 CENT(S). IT IS OBVIOUS THAT WE ARE GETTING SOME BANKER SHORT COVERING IN CONJUNCTION WITH BANKER DELTA HEDGING. In ounces, the OI is still represented by just OVER 1 BILLION oz i.e. 1.017 BILLION TO BE EXACT or 145% of annual global silver production (ex Russia & ex China). we had 3 notice(s) filed upon for 300 oz of gold. when the record OI occurred on April 21, the price of silver was at $18.42 (OI record 234,000 contracts. Interestingly the SLV inventory on April 21 was 325 million oz and today it is 343 million dollars and the price of silver is $1.19 less. And the comex is a price discovery mechanism???? 1. Today, we had the open interest in silver FELL BY 3,944 contracts DOWN TO 203,459, (AND STILL CLOSE TO THE NEW COMEX RECORD SET ON FRIDAY/APRIL 21/2017 AT 234,787), DESPITE THE FALL IN PRICE FOR SILVER WITH YESTERDAY’S TRADING (6 CENTS). NO QUESTION THAT WE HAD SHORT COVERING BY THE BANKERS ALONG WITH SOME BANKER DELTA HEDGING. i)Late TUESDAY night/WEDNESDAY morning: Shanghai closed UP 2.13 POINTS OR .07% / /Hang Sang CLOSED UP 25.35 POINTS OR 0.10% The Nikkei closed UP 129.70 POINTS OR 0.66%/Australia’s all ordinaires CLOSED UP 0.15%/Chinese yuan (ONSHORE) closed DOWN at 6.8903/Oil UP to 51.51 dollars per barrel for WTI and 54.28 for Brent. Stocks in Europe OPENED IN THE RED EXCEPT LONDON ..Offshore yuan trades 6.8786 yuan to the dollar vs 6.8903 for onshore yuan. NOW THE OFFSHORE IS A LITTLE STRONGER TO THE ONSHORE YUAN/ ONSHORE YUAN WEAKER (TO THE DOLLAR) AND THE OFFSHORE YUAN IS A LITTLE WEAKER TO THE DOLLAR AND THIS IS COUPLED WITH THE STRONGER DOLLAR. CHINA RECEIVED NEWS THAT ITS DEBT HAS BEEN DOWNGRADED AND THUS ARE NOT HAPPY CAMPERS THIS MORNING. i)Last night, Moody’s downgrades China from Aa3 to A1 and warns about their worsening debt outlook. However at the end of their trading session, Shanghai ignored the downgrade and finished higher. If the Spanish government does not allow a regional referendum vote of independence, Catalonia threatens an immediate declaration of Independence. The total gold comex open interest ROSE BY A HUGE 13,7995 CONTRACTS UP to an OI level of 462,572 DESPITE THE FALL IN THE PRICE OF GOLD ( $5.50 with YESTERDAY’S trading). THE BANKERS SUPPLIED THE NECESSARY SHORT PAPER AS LONGS STAMPEDED INTO THE GOLD ARENA YESTERDAY WE MAY HAVE ALSO WITNESSED THE EXERCISING OF LONG CALLS IN THE JUNE GOLD CONTRACT MONTH. We are now in the contract month of MAY and it is one of the POORER delivery months of the year. In this MAY delivery month we had A GAIN OF 2 contract(s) RISING TO 27. We had 2 notices filed yesterday so we gained 4 GOLD CONTRACTS OR AN ADDITIONAL 400 gold ounce will stand for delivery and no contracts were cash settled through the EFP route where they receive a cash bonus plus a future gold contract. The next big active month is June/2017 and here the OI LOST 6951 contracts DOWN to 170,471. The non active July contract GAINED another 46 contracts to stand at 1087 contracts. The next big active month is August and here the OI gained 16,609 contracts up to 185,992. For the June 2016 contract month initially 48.189 tonnes stood for delivery. Eventually a huge 48.552 tonnes stood. And now for the wild silver comex results. Total silver OI FELL BY 3,944 contracts FROM 207,403 DOWN TO 203,459 DESPITE YESTERDAY’S TINY 6 CENT LOSS. IT SURE LOOKS LIKE OUR BANKERS HAVE CAPITULATED AGAIN AS THEY TRYING TO COVER THEIR SHORTS IN EARNEST. WE ALSO HAVE EVIDENCE OF SOME DELTA HEDGING BY THE BANKERS TRYING TO OFFSET THAT HUGE SHORT POSITION THEY HAVE BEEN BURGEONING OVER THE YEARS. (We now know for certainty that private EFP contracts are given by the bankers when faced with an upcoming active delivery month. We just do not know the makeup of that private deal. It is my contention that the longs in silver at the end of April were given a fiat bonus plus a long “in the money” call for a future May contract or a July contract. They were told not to exercise for a new contract until at least the first week of May is over so it would not look like a paper settlement which in reality it surely is. We are in the active delivery month is MAY Here the open interest LOST 8 contracts FALLING TO 71 contracts. We had 2 notices filed on yesterday , so we finally lost 6 notices or an additional 30,000 oz will not stand for delivery and these were settled through the EFP route. The non active June contract LOST 11 contracts to stand at 670. The next big active month will be July and here the OI LOST 4635 contracts DOWN to 146,453. Yesterday’s confirmed volume was 341,064 contracts which is excellent. Today, 0 notice(s) were issued from JPMorgan dealer account and 0 notices were issued from their client or customer account. The total of all issuance by all participants equates to 3 contract(s) of which 0 notices were stopped (received) by jPMorgan dealer and 0 notice(s) was (were) stopped/ Received) by jPMorgan customer account. To calculate the initial total number of gold ounces standing for the MAY. contract month, we take the total number of notices filed so far for the month (524) x 100 oz or 52,400 oz, to which we add the difference between the open interest for the front month of MAY (27 contracts) minus the number of notices served upon today (3) x 100 oz per contract equals 54,600 oz, the number of ounces standing in this active month of MAY. IN THE LAST 12 MONTHS 79 NET TONNES HAS LEFT THE COMEX. Thus the initial standings for silver for the MAY contract month: 4583(notices served so far)x 5000 oz + OI for front month of APRIL. (71 ) -number of notices served upon today (8)x 5000 oz equals 23,230,000 oz of silver standing for the MAY contract month. We finally lost 6 contracts or an additional 30,000 oz will not stand for delivery and somebody wished to accept 6 EFP contract for a huge fiat bonus. TODAY’S ESTIMATED VOLUME OF 104,577 CONTRACTS EQUATES TO 522 MILLION OZ OF SILVER OR 75% OF ANNUAL GLOBAL PRODUCTION OF SILVER EX CHINA EX RUSSIA). IN OUR HEARINGS THE COMMISSIONERS STRESSED THAT THE OPEN INTEREST SHOULD BE AROUND 3% OF THE MARKET. 1. Central Fund of Canada: traded at Negative 6.3 percent to NAV usa funds and Negative 6.5% to NAV for Cdn funds!!!! Note: Sprott silver trust back into NEGATIVE territory at -0.17% /Sprott physical gold trust is back into NEGATIVE/ territory at -0.76%/Central fund of Canada’s is still in jail but being rescued by Sprott. *LAST 101 TRADING DAYS: A NET 26.75 TONNES HAVE NOW BEEN ADDED INTO GLD INVENTORY. *FROM FEB 1/2017: A NET 52.09 TONNES HAVE BEEN ADDED. Undermining the Federal Reserve received a major boost yesterday. Arizona Governor Doug Ducey signed into law a bill that eliminates capital gains taxes on gold and silver, thus allowing Arizona residents to use precious metals as currency instead of Federal Reserve notes. Currency competition against the monopolist Fed is starting to unfold. Let’s hope that other states follow in Arizona’s heroic footsteps. There’s no reason to wait for another severe financial crisis to act. 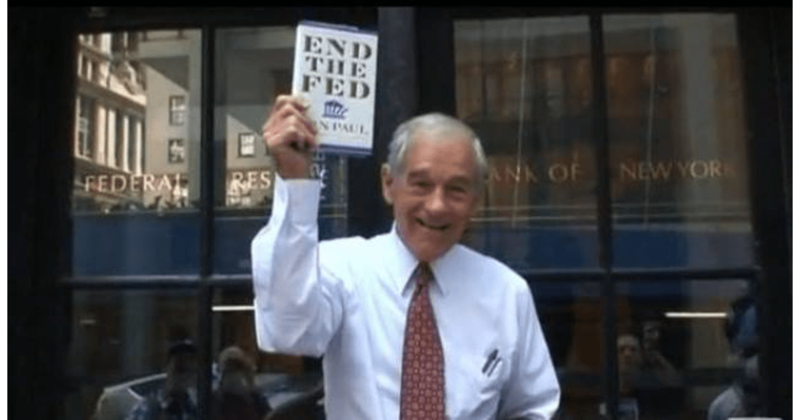 Campaign for Liberty Chairman Ron Paul and Campaign for Liberty President Norman Singleton issued the following statements regarding the Arizona Legislature’s passage — and Arizona Governor Doug Ducey’s signing — of HB 2014. Following comments from DoubleLine’s Jeff Gundlach tieing the surge in virtual currencies to the demise of China (right before that nation is downgraded), Bitcoin surged overnight, breaking above $2400 for the first time. It is now up over 150% year-to-date. The announcement is the latest bit of good news for the cryptocurrency. At the beginning of April, Japan announced bitcoin had become a legal payment method in the country. Additionally, Ulmart, Russia‘s largest online retailer, said it would begin accepting bitcoin even though Russia had said it wouldn’t explore the cryptocurrency until 2018. The gains also seem to be boosted by speculation the US Securities and Exchange Commission could overturn its ruling on the Winklevoss twins’ bitcoin exchange-traded fund. Yes, that market manipulation should be discussed at such length by a mainstream financial news organization is remarkable progress. But while at the conclusion of the interview with Asher a member of the CNBC panel wonders where records of the PPT’s interventions might be found, there is no suggestion that financial journalists should investigate possible interventions. Little GATA often has shown how easy it is to devise questions about intervention that central bank and government officials refuse to answer, lest their surreptitious activities be exposed and lose effect. So imagine what a major news organization could accomplish here. It could break the financial news story of the century. But nobody seems to want it. 3b Japan 10 year bond yield: RISES TO +.053%/ !!!! (Japan buying 100% of bond issuance)/Japanese yen vs usa cross now at 111.81/ THIS IS TROUBLESOME AS BANK OF JAPAN IS RUNNING OUT OF BONDS TO BUY./JAPAN 10 YR YIELD FINALLY IN THE POSITIVE/BANK OF JAPAN LOSING CONTROL OF THEIR YIELD CURVE AS THEY PURCHASE ALL BONDS TO GET TO ZERO RATE!! 3j Greek 10 year bond yield RISES to : 5.95% ??? 30 SNB (Swiss National Bank) still intervening again in the markets driving down the SF. It is not working: USA/SF this morning 0.9768 as the Swiss Franc is still rising against most currencies. Euro vs SF is 1.0930 well above the floor set by the Swiss Finance Minister. Thomas Jordan, chief of the Swiss National Bank continues to purchase euros trying to lower value of the Swiss Franc. Moody’s action on China briefly rattled Asian markets, but against a backdrop of strengthening global growth and the impending release of minutes from the Federal Reserve’s latest meeting, investors appeared to quickly move on. MSCI’s broadest index of Asia-Pacific shares outside Japan was unchanged while Japan’s Nikkei stock index ended 0.7 percent higher. The Shanghai Composite gained 0.1% at the close, reversing an early decline of 1%, while the offshore yuan inched up. As reported last night, the major overnight catalyst in Asia was Moody’s downgrade of China’s credit rating to A1 from Aa3 in early Asia trading, citing a worsening outlook for the nation’s financial strength – in the end of the Chinese session it had little impact, aside from another steep selloff in iron ore, which traded nearly limit down. The downgrade impact on regional currencies was likewise limited as Asia’s economic growth is seen to be improving and there are still positive stories such as S&P’s upgrade of Indonesia’s rating last week. By the end of the session, nobody even remembered China had been downgraded: the Shanghai Composite rose 0.1 percent, reversing a drop of 1.3 percent. The Hang Seng also ended higher after an earlier decline of 0.4 percent. Japan’s Topix index climbed 0.6 percent, while Indonesia’s benchmark index slumped 0.7 percent. The Australian dollar slipped 0.1 percent, paring a steeper drop of as much as 0.5 percent. Away from Asia, European stocks rose and U.S. equity futures and the dollar both steadied. The Stoxx Europe 600 Index climbed a second day, but struggled to gain momentum as miners slumped after China’s downgrade. That triggered declines across copper, nickel, zinc and iron ore. The British pound strengthened after two days of losses, even as Prime Minister Theresa May warned that further terrorist attacks could be imminent. S&P500 futures were little changed as investors awaited economic data and earnings reports, while volatility dropped for a fifth day. S&P 500 contracts expiring in June added less than 0.1% to 2,398.5 at 6:30 a.m. in New York. Crude extended gains a sixth day as OPEC prepared for Thursday’s key meeting in Vienna, and where an announcement of a 9 month productin cut extension now is fully priced in. In currencies, the dollar was little changed against most of its peers and Treasury yields were steady before the U.S. Federal Reserve releases later Wednesday the minutes of its May 3 policy meeting. With Fed due to release its May meeting minutes, “markets are ready to catch any clue regarding the likelihood of an interest- rate hike at the FOMC’s June meeting,” writes Ipek Ozkardeskaya, senior analyst at London Capital Group. Fed Bank of Philadelphia President Patrick Harker said June “is a distinct possibility” for the U.S. central bank’s second interest-rate increase of 2017. While equities quickly forgot the downgrade of China, the world’s top user of materials, industrial metals were far more bruised, as nickel slumped 1.9% and copper fell 0.6%. Iron ore futures dropped 4.7%. West Texas oil rose 0.2 percent to $51.56 a barrel, adding to a five-day advance ahead of tomorrow’s OPEC meeting. old added 0.1 percent to $1,252.30 an ounce, after dropping 0.8 percent on Tuesday. Elsewhere the Australian dollar fell and the yen pared losses against the U.S. currency after Moody’s Investors Service cut its rating on China’s debt for the first time in almost three decades. The euro was little changed ahead of the Fed minutes, even as ECB policy makers warned of the dangers of the ‘ripple effect’ from the house price boom and ‘significant’ bond risks spurring increased debt concerns. In rates, the yield on 10-year Treasury notes fell less than one basis point to 2.27 percent. Bonds fell during the previous four days. Yields on benchmark French, German and British bonds all dropped two basis points. Today investors await the minutes of the U.S. Federal Reserve’s latest policy meeting, scheduled to be released at 2pm. Fed funds futures show that traders now see a 75% chance that the U.S. central bank would will raise interest rates at its June meeting. “Our U.S. economists expect the minutes to come down on the hawkish side and continue to expect the Fed to hike in June and September and announce balance sheet reduction in December,” Citi analysts wrote on Wednesday. Equities fail to find firm direction and seemingly looking through China’s sovereign downgrade as Moody’s offers little in the way of any surprises. A very quiet morning in FX with focus on the FOMC minutes, alongside the OPEC/Non-OPEC meeting. European equities trade with little in the way of firm direction (Eurostoxx 50 flat) as earnings season continues to peter out and markets shrug of overnight news that Moody’s downgraded China’s sovereign debt rating. Chinese bourses were initially hit on the news given the surprise of the timing but ultimately the action taken is of little surprise given debt concerns and Moody’s bringing their rating in-line with that of Fitch and as such European traders have largely looked through the announcement. On a sector stand-point, energy names outperform ahead of this week’s OPEC meeting despite a lack of clarity on the duration of any potential extension. Material names underperform amid Dalian ore futures sliding over 5% over night. In fixed income markets, price action has been particularly uneventful with prices stuck in a somewhat narrow range. In peripheral markets, spreads are also relatively unchanged to their core counterparts with markets most likely looking for further direction from today’s speech by ECB’s Draghi and any further update on the Greek situation after the IMF and German Finance Minister Schauble reportedly struck an agreement on Greek bailout with the IMF willing to participate in the program if Greece proves debt is sustainable. In currencies, the Bloomberg Dollar Spot Index was flat after climbing 0.3 percent Tuesday. The pound rose 0.1 percent to $1.2971 following a two-day loss. The euro fell by less than 0.1 percent to $1.1178. It has been a very quiet morning in FX and if anything stands out it is the resilience in the cross JPY rates. This is in the face of the Moody’s downgrade of China’s credit rating, which garnered brief attention in Asia, but little else. USD/JPY has tested 112.00, but good selling interest seen here despite a small tip over the figure level. EUR/USD is still in pullback mode, but fresh demand coming in already. The FOMC minutes ahead may underpin expectations of a Jun move, and this should see USD bids picking up dips — 1.1200 intact as a result. Not that this is deterring Cable buyers still intent on tripping stops through 1.3060-70. We see little other reason for the resilient bid tone in the Pound given what lies ahead, with some suggesting traders are pre-empting a Tory win in the elections. We doubt this would lead to a significant charge higher from current levels, but impulsive markets are here to stay. In commodities, Iron ore led metals lower across the board today as the overnight markets reacted to the Moody’s downgrade of China’s credit rating. The DCE lost over 4.5% today, with the indices here requiring little to tip the balance these days. Copper has found some resistance at USD2.60 as many anticipated, but the pullback has been tame so far to suggest a more consolidative tone going forward. All eyes on Oil prices at the present time, and with the OPEC meeting not until tomorrow, but ongoing rhetoric supportive of an extension — though to what degree. 6 months is the minimum required to keep WTI above USD50.00, currently trading closer to USD52.00 while Brent is in the upper USD54.00’s. Precious metals are out of the spotlight, but Silver has crept back above USD17.00. Looking at today’s calendar, we’ll get the March FHFA house price index reading and also April existing home sales data. This evening we then get the FOMC minutes from the meeting on May 3rd where most be will combing through for discussion on the Fed’s balance sheet strategy. It’s another busy day for Fedspeak today too with Kaplan (6pm ) and Kashkari (6.30pm ) both scheduled. ECB President Draghi also speaks in Madrid at 1.45pm BST. Back in 1990 in an attempt to impress the young ladies on the school bus which we shared with the girls school next door I started watching Twin Peaks. I hated it but had to continue watching in case I could possibly be part of their arty, seemingly sophisticated conversation. They adored it (the show, not my input sadly). So it was some intrigue to me that a new series aired this week 25 years after the last one. I haven’t watched it yet but I wonder whether any of it will make sense. For the uninitiated it was a surreal, confusing supernatural drama that amongst other things included a red room where everyone spoke backwards. At 16 this was the height of cool and it was the most popular show of 1990. Thankfully the days of trying to impress a potential new partner are over. What impresses my wife most these days is me changing a nappy so I do that when I can instead. Talking of twin peaks, US equities have again edged up towards the highs after the S&P 500 closed last night within 0.30% of the all time peak from intraday last Tuesday before all the political headlines hit. The index was up +0.18% yesterday which means it has now gained for four consecutive sessions. You’d have to go back to February to find the last time it did that. The Dow (+0.21%) also edged up while there was a similarly positive mood in Europe with the Stoxx 600 (+0.22%) also finishing in positive territory. Some decent PMIs on both sides of the pond seemed to be the catalyst (we’ll come to those shortly) and it didn’t hurt that Oil continues to solidify gains. Indeed WTI (+0.66%) was up for the fifth day in a row yesterday and is holding above $51/bbl ahead of tomorrow’s OPEC meeting where there was more chatter yesterday from energy ministers that a nine-month extension agreement appears likely. In bond markets Treasuries (+2.6bps) and Bunds (+1.3bps) were a little weaker while in currencies the US Dollar (+0.38%) was up for only the second time in the last nine sessions. Needless to say that the tragic events in Manchester dominated the front pages around the world with UK PM Theresa May subsequently raising the terror alert in the UK to ‘critical’ from ‘severe’. Sterling (-0.30%) was a touch weaker yesterday and is holding just below $1.300 this morning. Before we go any further, the main news to report overnight is Moody’s cutting China’s sovereign credit rating by one notch to A1/Stable (was previously on Negative outlook). That is the first time Moody’s have cut China’s rating since 1989. The rating agency noted the likelihood of a “material rise” in economy-wide debt and expectations that China’s financial strength could “erode somewhat” as a result. China’s rating at Moody’s is now level with that of Japan and below other Asia economies of Taiwan and Macau. While there were no real revelations in the Moody’s statement the timing appears to have caught markets by surprise a little. Equity markets in China initially fell sharply on the news and while having pared back some of the losses, are still underperforming this morning. The Shanghai Comp is currently -0.63% and at the lowest level in nearly 8 months. It was initially down as much as -1.28%, while the CSI 300 and Shenzhen are -0.75% and -0.19% respectively. The Hang Seng is now flat after being in the red. Both the onshore (-0.10%) and offshore (-0.05%) renminbi are a shade weaker, while China’s sovereign 5y CDS is 1bp wider. The China sensitive Aussie Dollar is also down -0.40%. Elsewhere in Asia bourses are firmer and seemingly following the lead from Wall Street. The Nikkei (+0.48%), ASX (+0.10%) and Kospi (+0.20%) are all up. Away from markets, there were some interesting comments to come from the ECB’s Benoit Coeure yesterday. Speaking at a conference in Paris, Coeure said that “our current analysis of the secondary effects of negative rates suggest that there is no reason to change the indications we’ve given”. The board member also said that the ECB would start raising rates “well beyond the horizon” of asset purchases. Last week Coeure had said that the future path for rates was “not set in stone”. This suggests that the ECB is not about to change sequencing and is important as Coeure was previously seen as someone who had suggested a change in sequencing previously. We should get more hints at next month’s ECB meeting. Another focus for the market yesterday was Trump’s budget. Despite the wide acknowledgment that it stands little chance of being passed as proposed it was interesting to look at some of the details still. One questionable aspect is that the plan assumes that US economic growth would reach 3% by 2021 whereas the Fed and Congressional Budget Office project the US economy growing at an annual rate of just 1.8% and 1.9% in the coming years. In addition, the budget assumes to only balance in 10 years through strong growth. This follows the point we made in yesterday’s EMR about the UK not seeing a balanced budget until 2025 in the Conservative Party’s manifesto. Indeed one wonders how budgets will ever balance again in most countries especially given the demographic headwinds. Staying with the US the White House issued a statement yesterday saying that it does not confirm or deny ‘unsubstantiated claims based on illegal leaks from anonymous individuals’ concerning the investigation of the links between Russia and Trump’s presidential campaign. A reminder that former FBI Director James Comey is likely to testify next week which will no doubt be a talking point for the market. Back to those PMIs yesterday. In Europe the flash May composite for the Euro area came in at a fairly solid 56.8 which was modestly better than what the market was expecting and steady versus the April reading. The manufacturing reading edged up 0.3pts to 57.0 (vs. 56.5 expected) which offset a 0.2pt decline in the services reading to 56.2 (vs. 56.4 expected). In the country details there was a positive read-through in the data for both Germany and France. The former saw its composite rise 0.6pts to 57.3, driven by the manufacturing sector while the latter saw its composite rise 1pt to 57.6, driven by the services sector. This does however imply a roughly 1.1pt decline in the average composite for the periphery. Taken as whole, the composite reading for the Euro area implies GDP growth in Q2 of +0.8% qoq according to our economists, compared to their forecast of +0.5% qoq. Across the pond, the composite flash May reading in the US came in at 53.9 which was up 0.7pts from April. The details were a little more mixed however with the driver of the increase in the composite coming from the services sector where the PMI rose 0.9pts to 54.0. The manufacturing PMI actually edged down 0.3pts to 52.5. Away from the PMIs, the rest of the data in the US was a tad disappointing. New home sales fell sharply in April (-11.4% mom vs. -1.8% expected) albeit from a March reading which was revised up to an almost 10-year high. Meanwhile the Richmond Fed manufacturing index tumbled 19pts to +1 (vs. +15 expected), confirming some of the weaker data in the factory sector. In Germany Q1 GDP was confirmed as growing +0.6% qoq while the IFO business climate reading in May was revealed as climbing 1.6pts to a better than expected 114.6 (vs. 113.1 expected). The present situation index actually hit a new multi- decade high while the expectations index rose to its highest since February 2014. Finally in the UK the CBI’s distributive trades survey was disappointing with a net 2% of respondents reporting higher sales in May, down from 38% in April. Before we wrap up and look at the day ahead, it’s worth highlighting that German press outlet Handelsblatt was running a story yesterday suggesting that the IMF and German Finance Minister Wolfgang Schaeuble have reportedly reached an agreement on Greece. The article suggests that the IMF has signalled its willingness to participate in the program and would only provide money if Greece proves its debt is sustainable. Looking at today’s calendar, the only data due out in Europe this morning comes from Germany where the flash June consumer confidence reading is due. 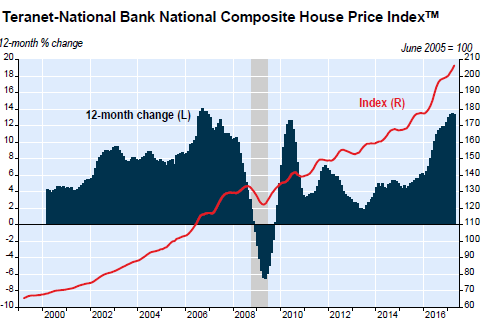 This afternoon in the US we’ll get the March FHFA house price index reading and also April existing home sales data. This evening we then get the FOMC minutes from the meeting on May 3rd where most be will combing through for discussion on the Fed’s balance sheet strategy. It’s another busy day for Fedspeak today too with Kaplan (11pm BST) and Kashkari (11.30pm BST) both scheduled. ECB President Draghi also speaks in Madrid at 1.45pm BST while Praet speaks this morning. Last night, Moody’s downgrades China from Aa3 to A1 and warns about their worsening debt outlook. However at the end of their trading session, Shanghai ignored the downgrade and finished higher. Offshore Yuan tumbled as Moody’s cut China’s credit rating to A1 from Aa3, saying that the outlook for the country’s financial strength will worsen, with debt rising and economic growth slowing. This leaves the world’s hoped-for reflation engine rated below Estonia, Qatar, and South Korea and on par with Slovakia and Japan. Full Statement: Moody’s Investors Service has today downgraded China’s long-term local currency and foreign currency issuer ratings to A1 from Aa3 and changed the outlook to stable from negative. The downgrade reflects Moody’s expectation that China’s financial strength will erode somewhat over the coming years, with economy-wide debt continuing to rise as potential growth slows. While ongoing progress on reforms is likely to transform the economy and financial system over time, it is not likely to prevent a further material rise in economy-wide debt, and the consequent increase in contingent liabilities for the government. The stable outlook reflects our assessment that, at the A1 rating level, risks are balanced. The erosion in China’s credit profile will be gradual and, we expect, eventually contained as reforms deepen. The strengths of its credit profile will allow the sovereign to remain resilient to negative shocks, with GDP growth likely to stay strong compared to other sovereigns, still considerable scope for policy to adapt to support the economy, and a largely closed capital account. China’s local currency and foreign currency senior unsecured debt ratings are downgraded to A1 from Aa3. The senior unsecured foreign currency shelf rating is also downgraded to (P)A1 from (P)Aa3. China’s local currency bond and deposit ceilings remain at Aa3. The foreign currency bond ceiling remains at Aa3. The foreign currency deposit ceiling is lowered to A1 from Aa3. China’s short-term foreign currency bond and bank deposit ceilings remain Prime-1 (P-1). Moody’s expects that economy-wide leverage will increase further over the coming years. The planned reform program is likely to slow, but not prevent, the rise in leverage. The importance the authorities attach to maintaining robust growth will result in sustained policy stimulus, given the growing structural impediments to achieving current growth targets. Such stimulus will contribute to rising debt across the economy as a whole. While China’s GDP will remain very large, and growth will remain high compared to other sovereigns, potential growth is likely to fall in the coming years. The importance the Chinese authorities attach to growth suggests that the corresponding fall in official growth targets is likely to be more gradual, rendering the economy increasingly reliant on policy stimulus. At least over the near term, with monetary policy limited by the risk of fuelling renewed capital outflows, the burden of supporting growth will fall largely on fiscal policy, with spending by government and government-related entities — including policy banks and state-owned enterprises (SOEs) — rising. GDP growth has decelerated in recent years from a peak of 10.6% in 2010 to 6.7% in 2016. This slowdown largely reflects a structural adjustment that we expect to continue. Looking ahead, we expect China’s growth potential to decline to close to 5% over the next five years, for three reasons. First, capital stock formation will slow as investment accounts for a diminishing share of total expenditure. Second, the fall in the working age population that started in 2014 will accelerate. Third, we do not expect a reversal in the productivity slowdown that has taken place in the last few years, despite additional investment and higher skills. Official GDP growth targets have also adjusted downwards gradually and the authorities’ emphasis is progressively shifting towards the quality rather than the quantity of growth. However, the adjustment in official targets is unlikely to be as fast as the slowdown in potential growth as robust economic growth is essential to fulfilment of the current Five Year Plan and appears to be considered by the authorities as important for the maintenance of economic and social stability. As a consequence, notwithstanding the moderate general government budget deficit in 2016 of around 3% of GDP, we expect the government’s direct debt burden to rise gradually towards 40% of GDP by 2018 and closer to 45% by the end of the decade, in line with the 2016 debt burden for the median of A-rated sovereigns (40.7%) and higher than the median of Aa-rated sovereigns (36.7%). More broadly, we forecast that economy-wide debt of the government, households and non-financial corporates will continue to rise, from 256% of GDP at the end of last year according to the Institute of International Finance. This is consistent with the gradual approach to deleveraging being taken by the Chinese authorities and will happen because economic activity is largely financed by debt in the absence of a sizeable equity market and sufficiently large surpluses in the corporate and government sectors. While such debt levels are not uncommon in highly-rated countries, they tend to be seen in countries which have much higher per capita incomes, deeper financial markets and stronger institutions than China’s, features which enhance debt-servicing capacity and reduce the risk of contagion in the event of a negative shock. Taken together, we expect direct government, indirect and economy-wide debt to continue to rise, signalling an erosion of China’s credit profile which is best reflected now in an A1 rating. The authorities’ commitment to reform is clear. It is quite likely that their efforts will, over time, improve the allocation of capital in the economy. Over the nearer term, the authorities have taken steps to contain the rise in SOE debt and to discourage some SOEs from further domestic and external investment, particularly in over capacity sectors. For example, one key set of reforms is the program of debt-equity swaps which aims to lower leverage in parts of the SOE sector, transferring the associated risks to the banking sector. At present, we estimate that the value of swaps announced is a very small fraction — around 1% — of SOE liabilities. Moreover, there is very little transparency about the terms of these transactions or their likely impact on SOEs’ and banks’ creditworthiness. Overall, we believe that the authorities’ reform efforts are likely, over time, to achieve some measure of economic rebalancing and improvement in the allocation of capital. But we think that progress will be too slow to arrest the rise in economy-wide leverage. With the crackdown on financial system leverage underway, Chinese banks (and securities firms) are in big trouble. As we noted previously, China’s bond curve is inverted, yields are surging, and Chinese regulatory decisions shutting down various shadow-banking pipelines has crushed securities firms’ stocks. However, as Bloomberg points out, as China’s deleveraging efforts cut into banks’ profit margins, rising base funding costs and interbank credit risk concerns have pushed banks’ cost of borrowing beyond the rate they charge customers for loans for the first time in history. Just hours after the UK raised its terror alert to Critical, or the highest possible, for the first time in ten years, Britain’s Interior minister Amber Rudd said that Salman Abedi, the Manchester suicide bomber who killed 22 people at a concert venue, and had recently returned from Libya had likely not acted alone and troops were being deployed to key sites across Britain to help prevent further attacks according to the FT.
Rudd said on BBC radio that the bombing was “more sophisticated than some of the attacks we’ve seen before, and it seems likely, possible, that he wasn’t doing this on his own.” She said Abedi had been known to security services before the bombing. Asked about reports that Abedi had recently returned from Libya, Rudd said she believed that had now been confirmed. Rudd said up to 3,800 soldiers could be deployed on Britain’s streets, taking on guard duties at places like Buckingham Palace and Downing Street to free up police to focus on patrols and investigation. An initial deployment of 984 had been ordered, initially in London, then elsewhere. The minister also scolded U.S. officials for leaking details about the investigation into the Manchester attack before British authorities were prepared to go public. Separately Rudd’s French counterpart said Abedi had links with Islamic State and had probably visited Syria too. According to Reuters, French Interior Minister Gerard Collomb said British investigators had told French authorities Abedi had probably travelled to Syria as well. The Islamic State promptly claimed responsibility for the Manchester attack, but there were contradictions in its accounts of the action and a lack of crucial detail. The bomber’s name, Salman Ramadan Abedi, was first revealed early on Tuesday by CBS in the U.S. and hours later the U.K. authorities put out a statement refusing to confirm the information until a formal identification had been completed. The police said any speculation would be “unhelpful and potentially damaging” to the investigation. It was only much later in the day, that the U.K. confirmed his identity. Separately, Manchester Police said on Wednesday morning three men had been arrested “after police executed warrants in south Manchester” in connection with the continuing investigation. On Tuesday police raided the Abedi family home in the Fallowfield district of south Manchester, in one of three operations carried out as authorities tried to establish whether Abedi was working alone or as part of a network. Family friends and neighbours said Abedi’s parents were originally from Libya and recently returned to the country. The son of Libyan immigrants, British-born Abedi, 22, blew himself up on Monday night at the Manchester Arena indoor venue at the end of a concert by U.S. pop singer Ariana Grande. His 22 victims included an eight-year-old girl, several teenage girls, a 28-year-old man and a Polish couple who had come to collect their daughters. The bombing also left 64 people wounded, of whom 20 were still receiving critical care for highly traumatic injuries. Update: Having mobilized hundreds of soldiers to protect key landmarks across London, the British police launched a huge manhunt for accomplices who may have helped Salman Abedi build the suicide bomb and “who could be ready to kill again.” Part of yesterday’s hike in the UK risk threat assessment is the fear that Abedi could have been working as part of a group of accomplices with possible links to militant groups who have the competence to plot and execute suicide bombings. “The question is: Was he acting alone or was he part of a network of others who want to kill. That is what the investigation is focusing on,” a source told Reuters adding that “the concern is that there may be others out there who helped him to make the bomb. Making a bomb of this sort requires a certain level of expertise and competence,” the source said. At an afternoon press conference, Manchester Chief Constable Ian Hopkins said it is clear “this is a network we are investigating.” He declined to give any further details on the investigation. British police have declined to provide many details about the suspect, but a U.S. official has said he was a British citizen of Libyan descent. British officials believe he had recently returned from Libya. Hopkins also wouldn’t comment on whether police had found anyone who made the explosive device used in the attack. Meanwhile, in the UK the police arrested at least three more men as part of their investigation into the suicide bombing as authorities said they are pursuing a “network” in connection with the attack. The arrests in Manchester take the total currently in custody to four. Under British law, a person can be taken into custody in a terrorism investigation and held up to 14 days without charges. As reported earlier (see below), U.K. investigators told French authorities that Abedi had probably also traveled to Syria, according to the French interior minister. A leading theory is that the attacker may have received specialist training abroad or that there is a technician in the U.K. who constructed the bomb, the Western official said. “To cause this many fatalities it has to be a viable device of a certain level of sophistication,” the official said, adding that it didn’t seem like something Abedi could have done by himself. Officials were still in the initial phase of the investigation, the person said. Earlier, Home Secretary Amber Rudd earlier told the British Broadcasting Corp. Abedi that Abedi was previously known to security services “up to a point.” “When this operation is over, we will want to look at his background and what happened, how he became radicalized and what support he might have been given,” she said. The constitutional crisis in Spain may be coming to a head quickly according to a leaked document on a “Secret Law for Catalonia Independence” as reported by El Pais. The document has a section that covers the referendum itself and features the question that would be asked of voters: “Do you want Catalonia to be a state that is independent from Spain?” The intention in the text is that this part of the legislation would come into effect first in order to be able to hold the referendum, and indicates that a majority of votes in favor, no matter how slim, and with no minimum participation level, would ratify the decision and mean that it was binding. The text makes a number of references to itself as being a “founding law,” and goes into exhaustive details – albeit with many legal loopholes and unknowns – about the breakaway: i.e. who would be a Catalan citizen, how it would be possible to obtain nationality, which Spanish laws would remain in force and which would not, what would happen to government workers currently employed by the state, among other details. The authors of the text ignore legal and material elements that have enormous importance and complexity, such as the whether this new republic would continue to form part of Europe, or whether social benefits or pensions would be guaranteed, or whether all taxation – and fines for non-payment – would be the responsibility of the regional government. The Catalonia independence threat is smack on top of a Spanish government crisis in which Mariano Rajoy has threatened to dissolve parliament and call snap elections if his budget does not pass. The surprise results of Socialist Party (PSOE) leadership election on Sunday, in which Pedro Sánchez returned to power, makes it very likely Rajoy will not get his budget passed. For details, please see Voters Smack Spain’s Political Leadership: Snap Spanish Presidential Elections Coming Up? In an unexpected two-part warning from the ECB, the European Central Bank warned of “excessive exuberance” in some European housing markets, driven by offshore buyers, that could spread to other areas in a “ripple effect.” Separately, the ECB also said “debt-sustainability concerns” have risen in the past six months amid a potential increase in yields and political uncertainty in some countries. While it did not show it, the chart below from Goldman summarizes the threat: a normalization of European rates would result in double digit principal losses for bondholders in countries like German, Spain, France and Italy… but not if they sell first to other “greater fools.” It is this transition from a stable to a chaotic market, that is currently troubling the central bank. And while the BOC hedged by saying “the uncertainties outlined in the April MPR continue to cloud the global and Canadian outlooks” the market is clearly more impressed by the hawkish readthru, sending the Loonie surging after the report. End result: the USDJPY has tumbled to 5 week lows. We have long lamented the persistent understatement of soaring US housing costs in the Consumer Price Index, and thus the understatement of overall inflation as experienced by people with a roof over the head. But now two economists from the National Bank of Canada spell out their doubts about the housing inflation component in Canada’s overall CPI. The Consumer Price Index in Canada rose 1.6% in April year-over-year seasonally adjusted, Statistics Canada reported last week, same as in March, but down from 2.0% in February. Over the past four years, CPI inflation ranged from 0.4% to 2.4%. For inflation lovers, it was too tame. But Canadians – like Americans who’re in a similar boat – have long complained that life overall is getting a lot more expensive a lot faster than reflected in the CPI. And a big part of that expense is housing costs for owners and renters. That has been the obvious but ignored solution for years. Now some observers and the housing industry are saying wait… inflation is only 1.6%; why raise rates? StatCan’s CPI report detailed that “shelter costs” rose only 2.2% in April year-over-year, same as in February and March. “The homeowners’ replacement cost index (+3.9%) was the main upward contributor to the 12-month change in the shelter index, despite slowing growth since November 2016,” it said. That’s like so benign – compared to reality. Canadian CPI inflation continues to surprise on the downside despite robust GDP growth, low unemployment, surging home prices, and a depreciating currency. What’s helping keep inflation down? Shelter costs! This heavyweight component of the CPI (27% of the index) is currently growing an anemic 2.2% annually compared to a more robust 2.7% for all other services (a two-year high by the way). As a result, the Homeowner’s Replacement Cost component of the CPI (20% of shelter costs) is no higher in British Columbia than it was in… 2005! Note that the NHPI is also used for the calculation of the Mortgage Interest Cost component of the CPI (12% of Shelter costs) which, incidentally, remains stuck at a decade low. 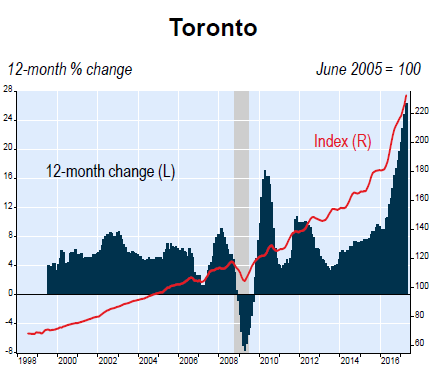 We are also baffled by the reported cumulative increase of only 37% for the Toronto NHPI since 2008 (vs. 118% according to resale market data). 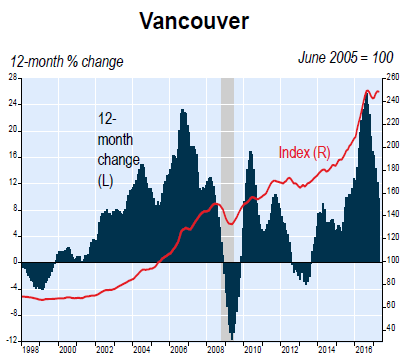 Also helping keep inflation in check, the Rent component of the CPI (22% of shelter costs) shows rent inflation averaging near a record low of 1% in Toronto, Montreal and Vancouver. 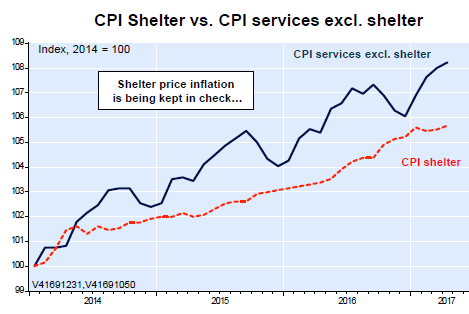 Bottom-line: Shelter Cost inflation reported in the Canadian CPI report is eerily low. 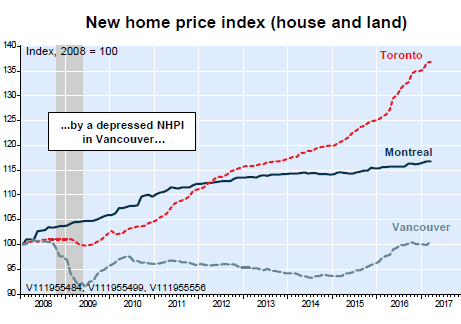 “Eerily low” may be one of the best descriptions I’ve heard – and from the Chief Economist at the seventh largest bank in Canada – to describe the housing inflation component of CPI and overall increases in CPI. This principle of understating the increases of the actual costs of living by understating the impact of soaring housing costs is also true for the US where the housing component of inflation and therefore overall inflation as measured by CPI remain “eerily low” as well. When OPEC sits down on Thursday, keeping the price of Brent above $50 (to avoid a budget catastrophe and social upheaval in Saudi Arabia) and below $60 (to prevent US production from going exponential), will be just one problem the cartel nations and various hangers-on will be desperate to solve. A much bigger one, literally, is the problem that led to this week’s OPEC meeting in the first place, and years of headache for OPEC and non-OPEC nations: a record global oil inventory glut. The supply glut that began in mid-2014 has dumped almost one billion barrels of petroleum into global inventories. However, of this only 35–45% has ended up in transparent OECD tanks. For OPEC, that is all the matters – in the past, OPEC oil ministers have repeatedly referenced the level of OECD petroleum inventories relative to their five-year average as a gauge of the rebalancing. And, as ScotiaBank notes, those inventories were more than 280 Mbbl above their five-year average as of January and, while European stocks have been falling into a healthier range, the same cannot be said of industry stocks in the US, which despite declining for several weeks, are just below all time highs. As we have explained on several occasions over the past year, China’s SPR is far more important to the global oil (im)balance and inventory glut than the less than a third of total oil produced since the summer of 2014 and stored. This is due to one main reason: while ScotiaBank is correct that any draws will likely come from OECD storage, it forgets the demand side of the equation. One year ago, JPMorgan estimated that the daily build of China’s SPR, had grown at a breakneck pace, from 491Kbpd average in 2015 to a record 1.191MMbpd in 2016 through May, equivalent to roughly 15% of the country’s total crude oil imports. More importantly, it was roughly a year ago when JPM calculated that China’s SPR was getting dangerously close to its estimated capacity, just over 500 million barrels. JPM also made a forecast that based on its assumptions, Chinese oil imports would slide by roughly the amount that would have been going into the SPR starting in late 2016 as the reserve hit capacity. When that did not happen, there was much confusion among the commodity space, until in late September 2011, satellite imagery from Orbital Insight revealed that the total size of China’s SPR was vastly greater than previously estimated. According to satellite images by geospatial analytics startup Orbital Insight, China, has not only misrepresented how much oil it has stored, it has done so at a massive scale, with the real number dwarfing even JPM own estimate: the real amount of Chinese oil in storage, according to Orbital, was a whopping 600 million barrels as of May. Assuming JPM’s estimated rate of SPR accumulation of about 1mmbpd, the 600 million number as of May would have grown to well over 700 million barrels as of September. To be sure, in late 2016 other skeptics started warning that even with the revised size estimates, China’s SPR was likely approaching capacity. Last September, the IEA warned that “recent pillars of demand growth China and India are wobbling.” S&P Global Platts’ Ernsberger, cited by CNBC, said that the slowdown in Chinese demand was worrying for major oil producers. We don’t know just yet, but according to data released by the General Administration of Customs data on Tuesday, China’s oil stockpiling pace finally tumbled to 1.36mbpd in April, from 1.6mbpd in March, the sharpest decline in reserve accumulation in years, and in line with the recent slowdown from record oil imports. If indeed China is finally at capacity for the SPR, the SPR stocpiling is about to fall off as cliff this month. WTI/RBOB prices were relatively unchanged from last night’s API inventory print (despite some volatility from OEPC headlines) ahead of the DOE print, but that did not last long as Crude saw a much bigger than expected draw (-4.43mm vs -2mm exp) and gasoline a considerably smaller draw than API (-787k vs -3.18mm API) and the same with distillates. Lower 48 crude production rose for the 16th straight week and seemed to take the shine off the inventory data – sending WTI/RBOB prices lower. Bloomberg’s Mitchell Martin notes that gasoline stockpiles are more than 9% above the five-year average. Summer driving season will likely take on greater significance this year, but gasoline consumption may rise less than 1% from last year’s level. Bloated distillate inventories are being relieved by exports, but stockpiles remain 15% above the five-year average, even with demand from railroads and industrial users helping to boost consumption to a five-year high in April. Bloomberg’s Laura Blewitt notes that we can thank Gulf Coast refiners for that massive crude draw. PADD 3 refinery crude runs rose to the highest on record in data going back to 1992. Javier Blas points out that the U.S. continues to import lots of crude from Saudi Arabia, despite the OPEC production cuts (creating a bit of mismatch between the rhetoric here in Vienna about the curbs and what refiners receive). Last week, U.S. refiners bought 1.371 million barrels a day from the kingdom, largely unchanged from the previous week (1.376 million). Shipments from Iraq fell significantly, but they were offset by a surge in Kuwaiti arrivals. All in all, Middle East crude appears to be plentiful in the U.S. Something OPEC will likely need to explain tomorrow at its official meeting. Gasoline (big build) was higher heading into the DOE data, crude was lower as ovenight streength faded after OPEC’s Vienna meetings ended with no statement today. Bloomberg’s Laura Blewitt points out that summer driving season arrives this weekend. This year comes with a unique price trend: the typical 50-cent spring surge in gasoline prices hasn’t happened. The reaction to the DOE data was clear – WTI up, RBOB down…BUT that did not last as both are lower now on the lack of product demand. Bloomberg notes that crude is on a nice bullish streak, not huge gains but steady daily ones. In the five days through Tuesday, WTI gained 41, 28, 98, 40 and 34 cents. The flip to July delivery also helped the front-month contract, pushing it to the highest settlement since April 18. Aggregate volume hasn’t been rising with the price, though. Both days this week were under 1 million trades after being over a million from May 2 to May 19 with the exception of May 12, when volume totaled 999,989. 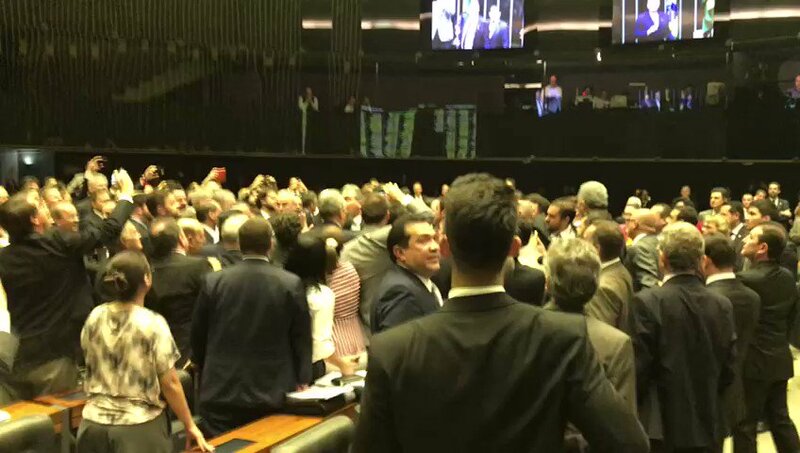 Update 2: Physical confrontation erupts in Brazil’s Congress between Temer’s supporters & opponents after he deploys the military against protesters. #Brazil#Brasilia Protesters have set fire to the finance ministry. Protesters chanting “Out with Temer!” marched to the presidential palace to demand an end to austerity reforms, AFP reports adding that police stopped their advance by using tear gas, while the protesters retaliated by throwing stones at the officers. Brasilia’s security service said that 500 buses had converged on the capital, with some 25,000 protesters. Organizers claimed there were far more, but an independent estimate was not immediately possible. “Damned government,” a man said as he retreated, with eyes streaming from the effects of the tear gas. “Four people were detained by police,” Brazil’s Globo broadcaster reported, citing a police statement that also said three of the arrested had drugs on them and another a melee weapon. Protesters then set the Agricultural Ministry’s building on fire and smashed windows at several other ministerial buildings, Brazilian media report. All ministry buildings were subsequently evacuated and civil servants sent home. Early WEDNESDAY morning USA 10 year bond yield: 2.28% !!! UP 0 IN POINTS from MONDAY night in basis points and it is trading JUST BELOW resistance at 2.27-2.32%. The 30 yr bond yield 2.937, DOWN 1/2 IN BASIS POINTS from TUESDAY night. USA dollar index early WEDNESDAY morning: 97.36 UP 1 CENT(S) from TUESDAY’s close. The British pound at 5 pm: Great Britain Pound/USA: 1.2974 : UP .0019 OR 19 BASIS POINTS. The dollar fell to a fresh low for the session after the minutes of the Federal Open Market Committee’s May meeting showed that “a few” participants expressed concern that progress on inflation might have slowed. FOMC participants generally judged that it would be prudent to await more evidence that weaker economic data was “transitory” before further removing accommodation. Does that look transitory? U.S. Treasuries rose after the release of the minutes while the greenback tumbled. Fed funds futures continued to price around 80 percent odds of a June rate increase. Legendary vulture investor Asher Edelman, the 1980s model for Gordon Gekko, strayed into what must’ve been uncomfortable territory for CNBC during an appearance on “Smart Money” when he discussed his view that the government’s “plunge protection team” is the only thing propping up the current market rally, and said he suspects that it has again been recently een intervening in the market to keep stocks at record highs. Few can explain the market’s recent resilience, holding near record highs despite weak economic data and intensifying geopolitical tensions. The main benchmarks have risen for the fourth straight day following last week’s “Trump Dump” despite a terror attack in the U.K., the worst soft economic data since February 2016, and surprisingly low trading volume. It’s believed – as the name would suggest and as has been profiled on countless occasions on this website previously – that the group’s mandate is to maintain stability in the market and head off any severe crashes like what was seen in 1987. It’s believed the group reports only to the president, though the head of the Treasury, head of the Securities and Exchange Commission and Federal Reserve Chairman are also involved. The team, according to Asher, steps in to execute trades on all exchanges when the market isn’t behaving as it would like, working only with big banks like Goldman Sachs Group and Morgan Stanley. “We have seen the most extraordinary lack of volatility in the VIX since Trump has been in office and it’s interesting the night he was elected you may recall the futures came down about 400 or 600 points. That may have been the case in the 1980s, however in recent years the PPT is the collaboration of the NY Fed and Citadel, which are most aggressive during times of substantial market stress and selling, when intervention is needed to stop the downward momentum in prices. Edelman says he believes one sign of TPP intervention is when a smaller, less-liquid stock suddenly rises late in the trading day. We’ve noted in the past that there appears to be a rule against mentioning the team on CNBC – with guests routinely getting “Schiff’d” for doing so. And once again, this time, the “theory” was treated with derision by his fellow hosts. “I think we all have so many questions here I don’t think I know where to begin,” Fast Money host Melissa Lee said. Some audience members were more enthusiastic. I can’t believe @AsherEdelman just talked about the PPT on @CNBCFastMoney. Didn’t think anyone was allowed to talk about it. That was crazy. In the aftermath of prior media reports that in the past Deutsche Bank provided hundreds of millions in loans to Trump, today Democratic lawmakers – looking for a smoking gun- asked Germany’s largest bank to hand over its findings on “two politically charged matters”, demand details whether Trump accounts have Russia ties, and if Deutsche Bank loans to Trump were backed by Russia. We write seeking information relating to two internal reviews reportedly conducted by Deutsche Bank (“Bank”): one regarding its 2011 Russian mirror trading scandal and the other regarding its review of the personal accounts of President Donald Trump and his family members held at the Bank. What is troubling is that the Bank to our knowledge has thus far refused to disclose or publicly comment on the results of either of its internal reviews. As a result, there is no transparency regarding who participated in, or benefited from, the Russian mirror trading scheme that allowed $10 billion to flow out of Russia. Likewise, Congress remains in the dark on whether loans Deutsche Bank made to President Trump were guaranteed by the Russian Government, or were in any way connected to Russia. It is critical that you provide thisCommittee with the information necessary to assess the scope, findings and conclusions of your internal reviews. Along with the internal review of the Russian stock-trading scheme, Democrats are seeking any internal correspondence and communications related to loans extended to Trump and his immediate family members. The bank has made more than $300 million in loans to Trump, for the Doral golf resort in Florida, a Washington, D.C., hotel and a Chicago tower. “Deutsche Bank’s pattern of involvement in money laundering schemes with primarily Russian participation, its unconventional relationship with the President, and its repeated violations of U.S. banking laws over the past several years, all raise serious questions about whether the Bank’s reported reviews of the mirror trading scheme and Trump’s financial ties to Russia were sufficiently robust,” the lawmakers wrote in the letter. It was not clear just how Russia would “guarantee” a loan that is by definition secured (as a recourse loan at that) by an asset, although the confusion is understandable, as the initiative is being spreadheaded by Maxine Waters, who together with four other Democrats on the House Financial Services Committee, has asked the Frankfurt-based lender for the various documents. Other details: the lawmakers asked whether the bank’s loans to Trump, made years before the New York developer ran for president, “were guaranteed by the Russian government, or were in any way connected to Russia.” A copy of the letter sent to the bank was reviewed by Bloomberg News. That said, it is unlikely that either Trump or DB will lose much sleep over this initial disclosure request: as the minority party, Democrats don’t have the power to force Deutsche Bank to make any disclosures. Furthermore, it’s not clear whether Representative Jeb Hensarling of Texas, the chairman of the committee, shares his colleagues’ interest in the matter. If past is prologue, the answer is most likely note: Bloomberg reminds us that the same group of Democrats demanded in March that Hensarling hold a hearing to explore the bank’s conduct in the Russian mirror-trading scandal, as part of an effort to ensure that the Justice Department investigation wasn’t influenced by the lender’s relationship with Trump. No hearing has been scheduled. That said, Democrats may have a good reason to peek inside DB’s book, citing the bank’s previous compliance failures, “which have resulted in more than $6 billion in fines and penalties to U.S. regulators since 2015.” Previously, Bloomberg has reported that the bank’s loans to Trump were structured as “recourse” loans, which, in the case of default, would allow the bank to go after Trump’s own assets. Following yesterday’s collapse in new home sales, NAR reports that existing home sales in April also disappointed – dropping 2.3% (and March revised lower). This drop happens as median home prices spiked 6.0% YoY to record highs as sales declines are blamed once again on a lack of supply (forget affordability?). The median existing-home price for all housing types in April was $244,800, up 6.0 percent from April 2016 ($230,900). April’s price increase marks the 62nd straight month of year-over-year gains. Total housing inventory at the end of April climbed 7.2 percent to 1.93 million existing homes available for sale, but is still 9.0 percent lower than a year ago (2.12 million) and has fallen year-over-year for 23 consecutive months. Unsold inventory continues to rise and is at a 4.2-month supply at the current sales pace. Lawrence Yun, NAR chief economist, says every major region except for the Midwest saw a retreat in existing sales in April. “Last month’s dip in closings was somewhat expected given that there was such a strong sales increase in March at 4.2 percent, and new and existing inventory is not keeping up with the fast pace homes are coming off the market,” he said. As a reminder, the May University of Michigan Consumer Sentiment survey showed a six-year low among those who think it’s a good time to buy a house and a 12-year high among those who say it’s a good time to sell. Disparities of this breadth tend to coincide with break points and that’s just where we’ve landed in the cycle. The beginning of May officially marked the advent of a buyers’ market, defined simply as sellers outnumbering buyers by a wide enough margin to trigger falling prices. Yes, it’s the moment buyers have been waiting for. It is also the moment private equity investors, those who’ve crowded out natural buyers, have been dreading. Having top-ticked US economic data with its March rate-hike, all eyes are on the May minutes to confirm the total lack of data-dependence now present at The Fed. The main focus of the minutes was on the ‘normalization’ of the balance sheet (since June hike odds are at 100%), which was confirmed with details of the plan revealed. Economic weakness in Q1 was shrugged off as “transitory” – although with the provision that evidence is needed – and tightening as well as balance sheet rolloff is appropriate “soon”, likely signaling that a June rate hike is on despite the recent economic slowdown. Fed also warns of asset valuations. The staff judged that the weakness in first-quarter real GDP was probably not attributable to residual seasonality and that it instead reflected transitorily soft consumer expenditures and inventory investment. Importantly, PCE growth was expected to pick up to a stronger pace in the spring, which would be more consistent with ongoing gains in employment, real disposable personal income, and households’ net worth. Members generally judged that it would be prudent to await additional evidence indicating that the recent slowing in the pace of economic activity had been transitory before taking another step in removing accommodation. It was noted that much of the recent slowing likely reflected transitory factors, such as low consumer spending for energy services induced by an unusually mild winter and a decline in motor vehicle sales from an unsustainably high fourth-quarter pace. Nevertheless, contacts expected that demand for motor vehicles would be well maintained. With respect to the economic outlook and its implications for monetary policy, members agreed that the slowing in growth during the first quarter was likely to be transitory and continued to expect that, with gradual adjustments in the stance of monetary policy, economic activity would expand at a moderate pace, labor market conditions would strengthen somewhat further, and inflation would stabilize around 2 percent over the medium term. Although the data on aggregate spending and inflation received over the intermeeting period were, on balance, weaker than participants expected, they generally saw the outlook for the economy and inflation as little changed and judged that a continued gradual removal of monetary policy accommodation remained appropriate. Consistent with the downside risks to aggregate demand, the staff viewed the risks to its outlook for the unemployment rate as tilted to the upside. The risks to the projection for inflation were judged to be roughly balanced. The downside risks from the possibility that longer-term inflation expectations may have edged down or that the dollar could appreciate substantially were seen as roughly counterbalanced by the upside risk that inflation could increase more than expected in an economy that was projected to continue operating above its longer-run potential. This overall assessment reflected the staff’s judgment that leverage as well as vulnerabilities from maturity and liquidity transformation in the financial sector were low, that leverage in the nonfinancial sector was moderate, and that asset valuation pressures in some markets were notable. Although these assessments were unchanged from January’s assessment, vulnerabilities appeared to have increased for asset valuation pressures, though not by enough to warrant raising the assessment of these vulnerabilities to elevated. So… the prices are too high? “Under the proposed approach, the Committee would announce a set of gradually increasing caps, or limits, on the dollar amounts of Treasury and agency securities that would be allowed to run off each month, and only the amounts of securities repayments that exceeded the caps would be reinvested each month. As the caps increased, reinvestments would decline, and the monthly reductions in the Federal Reserve’s securities holdings would become larger. The caps would initially be set at low levels and then be raised every three months, over a set period of time, to their fully phased-in levels. The final values of the caps would then be maintained until the size of the balance sheet was normalized. So what happens when The Fed balance sheet normalization begins? Under the House-passed Bill, the US budget deficit would be reduced by $119 billion between 2017 and 2026. This is $31 billion less than the proposed March bill, which would have lowered the deficit by $150 billion. Offsetting the smaller benefit on the deficit, the CBO found that the number of Americans expected to lose their health coverage would rise to 23 million in 2026, which is 1 million fewer than the 24 million forecast in March, or roughly $31 billion in spending over 10 years to provide 1 million Americans with insurance over the same time period. The CBO concludes that in 2026, an estimated 51 million people under age 65 would be uninsured, compared with 28 million who would lack insurance that year under current law. Under the last CBO estimate, the number of Americans wihtout insurance in 2026 was 52 million of Americans under 65, so an improvement of 1 million as expected. CBO and JCT estimate that, in 2018, 14 million more people would be uninsured under H.R. 1628 than under current law. The increase in the number of uninsured people relative to the number projected under current law would reach 19 million in 2020 and 23 million in 2026. In 2026, an estimated 51 million people under age 65 would be uninsured, compared with 28 million who would lack insurance that year under current law. Under the legislation, a few million of those people would use tax credits to purchase policies that would not cover major medical risks. 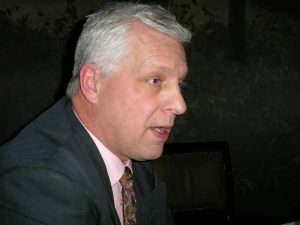 Join Greg Hunter as he goes One-on-One with financial expert Rob Kirby of KirbyAnalytics.com.